When Ali was released in 2001 it received decidedly mixed reviews. While Will Smith was praised for his impressive physical transformation into legendary boxer Muhammed Ali, the film itself was criticized for revealing nothing new about the man. Herein lies the problem that Michael Mann and company faced: how do you shed new light on one of the most documented historical figures of the 20th Century? Like he did with The Last of the Mohicans (1992), Mann has revisited Ali again on DVD with a new cut of the film. He’s taken out approximately 20 minutes of footage and put 30 minutes of previously unseen footage back in. The effect? Hard to tell unless you’ve seen the film many times but Mann claims that the politics of the times are more the focus this time around. Ali focuses on ten turbulent years of the boxer’s life, from 1964 to 1974. These years are arguably the most fascinating ones of Ali’s life because they are so rife with dramatic possibilities. It was during this period that Ali became the World Boxing Champion after beating Sonny Liston, then, lost it when he refused to serve as a foot soldier in the Vietnam War, and finally reclaimed the Championship Title after beating the odds-on favourite, George Foreman in Zaire. It was also a time of great social and political upheaval in the United States with the assassinations of Malcolm X and Martin Luther King, Jr. Finally, Ali also shows the man’s private side: his numerous wives and failed marriages, and his friendships with Malcolm X and Howard Cosell. Mann immediately immerses the audience in the time period with a montage of footage that features Sam Cooke performing in front of a live audience and Ali (Smith) training and fighting. Mann fractures time by also intercutting footage of Ali as a child witnessing the brutality of racism and its effects and then cuts back to a mature Ali sitting in on a lecture by Malcolm X (Van Peebles). The entire montage is masterfully edited to the beats of a medley of Sam Cooke songs. This opening sequence establishes the Impressionistic take that Mann is to going to have on Ali’s life. The fight scenes are covered from every conceivable angle as Mann cuts back and forth from shots outside and inside the ring. The most effective ones are tight and close point-of-view angles that are in the ring with the boxers. They give the fight scenes a real visceral impact and immediacy that hasn’t been seen since Martin Scorsese’s Raging Bull (1980). If the film works at all (and it does), it is due in large part to Will Smith’s performance. Known mostly for mindless, yet entertaining action films like Bad Boys (1995) and Independence Day (1996), he was not exactly most people’s first choice to play Muhammed Ali. However, Smith showed that he had the capacity for more substantial work with Six Degrees of Separation (1993) but he had never attempted anything as challenging as this project. Smith physically transforms himself into the boxer. He trained for a year and bulked up for the role. He also captures Ali’s distinctive speech patterns, especially his flamboyant, larger-than-life public persona. Like Anthony Hopkins before him in Nixon (1995), Smith does not look exactly like the actual person he is playing. Instead, he looks close enough to capture the essence and the spirit of the man. He also does a good job of conveying Ali’s conflict between his loyalty to Islam and to his family and friends. Smith peels back the layers to show that there was so much more than his flashy public side. For example, most people only saw Ali and Cosell as antagonists, but this was only for show. In fact, they were good friends and the sportscaster was willing to help him out in any way possible. Mann wisely takes a page out of Stone’s book and, like with Nixon, he populates his supporting cast with a fantastic roster of character actors: Jamie Foxx, Jon Voight, Jeffrey Wright, Joe Morton, and so on. Jamie Foxx, in particular, is a revelation as Drew “Bundini” Brown, one of Ali’s entourage. Foxx, like Smith, was known primarily as a comedic actor and disappears completely into his role (much like he did in Oliver Stone’s Any Given Sunday) as a deeply flawed character beset by drug and alcohol addiction. Also of note is Jon Voight who looks and sounds uncannily like famous TV sports broadcaster Howard Cosell. There is an audio commentary by writer/director Michael Mann. He does an excellent job of putting the film into its historical context. He says that he wasn’t interested in doing a docudrama. He wanted the audience to see the world through Ali’s eyes and to show how different the world was during that time period. 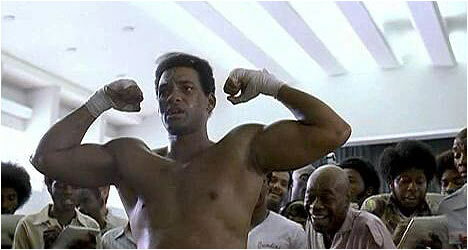 During the fight scenes, Mann also goes into great detail about the boxer’s tactics and how he won his matches. The director clearly did his homework and points out who everyone is and the significance of the events depicted in the movie which is a nice consideration for viewers not familiar with this particular period of time. This is an extremely informative track and Mann contributes many very thoughtful observations over the course of the movie. “The Making of Ali” is a 29-minute featurette that originally aired on HBO. It is slightly better than your average electronic press kit and features some decent on the set footage and interview sound bites with Mann and various members of the cast. It shows how hard Will Smith trained to become Ali. The featurette also covers various aspects of the film: the acting, editing, camerawork and the soundtrack. Ali eschews the traditional docudrama for a more impressionistic take on the man and life. Mann’s film may not say anything new about the famous boxer, but it does depict an exciting ten years of his life in a masterful and richly evocative fashion. This DVD features an excellent transfer of the movie with an aggressive 5.1 surround soundtrack and is definitely worth purchasing for Mann fans for his audio commentary alone.